Ditch your tinny flat-screen speakers and let the QFX 2.0 Channel Bluetooth Soundbase fill the room with deep, throaty bass and clear, enhanced dialogue. 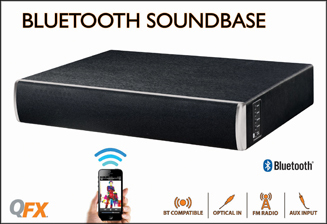 Able to support televisions up to 55”, the QFX Soundbase includes three pre-optimized sound modes: Movie, Music, and Talk. Nothing good on T.V.? Pair your favorite Bluetooth device or smartphone to wirelessly share your favorite music and videos with friends, family, and lightly sleeping neighbors!